Chu-kù: "The love of liberty brought us here"
Kok-koa: All Hail, Liberia, Hail! Liberia Kiōng-hô-kok (Eng-gí: Republic of Liberia) sī Hui-chiu sai-hái-hoāⁿ ê kok-ka. ↑ "Liberia". 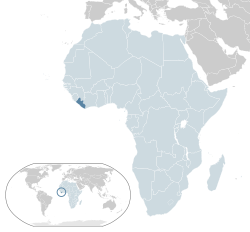 The World Bank country page for Liberia. The World Bank. 2015. September 4, 2014 khòaⁿ--ê. ↑ 2.0 2.1 2.2 2.3 "Liberia". International Monetary Fund. Chit ia̍h siāng bóe tī 2017-nî 12-goe̍h 3-ji̍t (Lé-pài), 08:17 ū pian-chi̍p--koè.